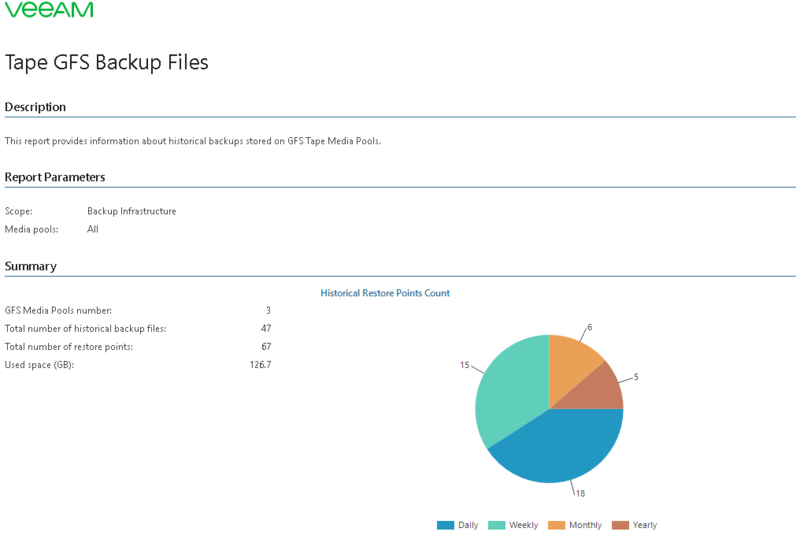 This report provides information about historical backups for Veeam Backup & Replication backup to tape with GFS retention policy. The Summary section provides information on the number of GFS media pools, number of historical backup files, number of restore points in these files, and the amount of space consumed by historical backup files on tape. The Historical Restore Points Count chart shows the number of weekly, monthly, quarterly and yearly restore points in historical backup files. The Details table provides information about historical restore points in GFS media pools, including the media set, number of VMs and computers, date when restore point was created, name of a tape job that created the restore point, and ID of tapes on which the restore point resides. Click the Backed up VMs/Computers link or Restore Point Date link to drill down to the list of VMs and computers in the restore point, restore point date and IDs of tapes on which the restore point resides. The report allows you to inventory historical backups on tape created in accordance with the GFS retention scheme. You can track historical restore points on tape and make sure that you have backups archived for long-term retention. Media Pool: defines a list of Veeam Backup & Replication GFS media pools to analyze in the report.